Answer to Case Study 7 - Identify the cause? A 35 year old male was admitted to a hospital with fever, chills and generalised body pain. The patient had received multiple courses of antibiotics prescribed by private practitioners before diagnosis. Serum of the patient was tested positive for HIV by ELISA and his CD4 cell count was 800 cells/μL. His blood culture showed growth with Gram positive cocci. Upon subulture on MacConkey agar, pin pointed pink colour colonies were observed. The isolate was found to be PYRase positive, CAMP test negative and resistant to Bacitracin, Penicillin and Vancomycin. Proceed and identify the microorganism? 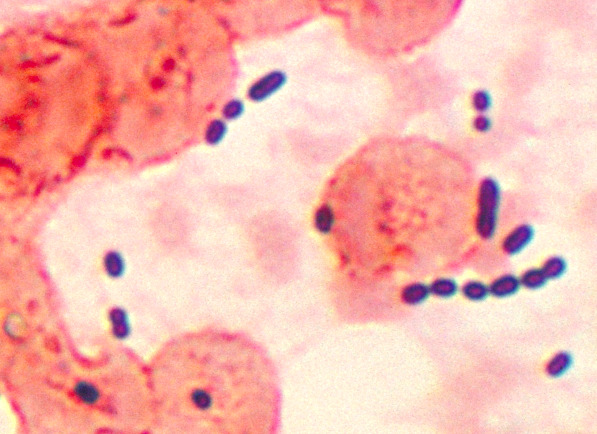 Gram positive cocci grown in blood culture (Staphylococci, Micrococci, Streptococci or Enterococci). Grown on Macconkey agar without Crystal Violet (Streptococci susceptible to bile salts - ruled out). So the organism is suspected to be Enterococci. Enterococci are intrinsically resistant to most antibiotics at low level and are prone to acquire high level resistance if judicial treatment was not attempted. This isolate is found to be resistant to penicillin and vancomycin. For invasive infections of enterococci synergistic therapy is recommended to achieve a bactericidal activity. Ampicillin form pores in the cellwall of bacterium and allows the entry of gentamicin into the cell, where it will inhibit the protein systhesis. uff... its not making a big of a mess like the super bug problem..it says that indians are responsible for this.. but i dont think so..